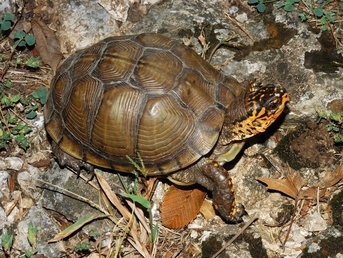 FreshMarine.com - The Three-Toed Box Turtle - Terrapene carolina - Buy Eastern Turtle Now and Save! The Terrapene Carolina triunguisor the Three-toed box turtle is a subspecies of the common box turtle commonly found in North America. The Three toed turtle is endemic to the South-Central part of USA and has been declared the official reptile of Missouri. The Three toed turtle is a medium sized turtle that grows up to 5 inches carapace length. A few three toed turtles measuring around 7 inches have also been found. The carapace is brown and beige colored. The central, medial scutes are beige colored or light brown while the marginal scutes show darker coloration. The scutes on it carapace are not smooth and have ridges. The carapace is highly domed, non-serrated and keelless. The dome on the carapace is aligned more towards the posterior than other turtles of the species. The color of the plastron might vary from yellow to olive and is sparsely spotted than the other subspecies of the box turtle. Specimens from different areas show different coloration and patterns on their carapace. They might have stripes, random lines or spots or geometrical patterns all over the carapace.Even the bodies are variedly colored with colors of scales sand patterns in on the rest of the body completely different. The head is small, broad and is covered with red spots which are one of the most distinctive features of the Three Toed Box Turtle. The upper jaws are slightly notched. The scales on its forelimbs might be red or bright orange. The Terrapene Carolina triunguis derives its common name from the number of toes on its hind limbs. The Three toed Box Turtle are endemic to the swamps and grasslands and coniferous or deciduous forests around temporary or permanent source of water. A subtropical humid climate and an abundance of plants and wood are essential components of its ideal habitat. Its range extends from Missouri in the north to Louisiana in the south. The three toed turtles are protected in the state of Florida and possession of more than two is illegal. They are hardy turtles and easily adapt to their captive environment and their keepers. Like all other turtles the recommended captive habitat for The Three Toed Box turtle is also a garden or any such open space. You can rest assured they can�t escape; they are too dull and dumb to escape. However in most cases it is not possible and in such cases it can be housed in a 50 gallon water aquarium designed as a terrarium with 50% land area and 50% water area. The terrarium should simulate its natural environment as much as possible. A UVB light and a heating lamp should be fitted in a dry area to serve as basking spot. The temperature should be maintained around 75 to 80 degrees Fahrenheit and humidity should be maintained by frequent misting. The Three Toed turtle is omnivore and its inclination to either flesh or fruit depends on the availability. You can feed the worms, insects, chunks of meat and chicken livers or leady vegetables and fruits. Over feeding should be avoided and once or twice a week calcium and vitamin supplements should be mixed with their food.